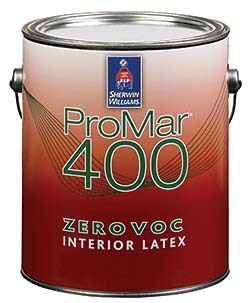 ProMar 400 zero volatile organic compound (VOC) latex paint ensures good hiding to conceal the previous coating and reliable touch-up to minimize callbacks. It is available in flat, low-sheen, eg-shel and semi-gloss. The paint meets VOC requirements and has achieved Greenguard Gold certification.